A Suitcase into a Chair and then into a Scooter in seconds! eFOLDi is simplicity itself to transform. Home demo or buy online. Magic Mobility Ltd are Ambassador Status sales agents for eFOLDi and have proven results for sourcing and promoting innovative and cutting edge mobility products. Please call Phil on 07733 438555 or contact us now to find out more about this amazing award winning machine or to book a Free No Obligation UK Home demonstration. BUY ONLINE WITH FREE DELIVERY & 3 MONTHS FREE INSURANCE! Click ‘Buy Now’ button to go to our eFOLDi shop. Huge demand so be quick! Get your eFOLDi in days. Stock is available so reserve now with ‘Buy Now’ to avoid disappointment. They are selling fast. Weighing in at just 17Kg, with standard FarReach battery, makes eFOLDi probably the lightest 8mph mobility scooter in the world. 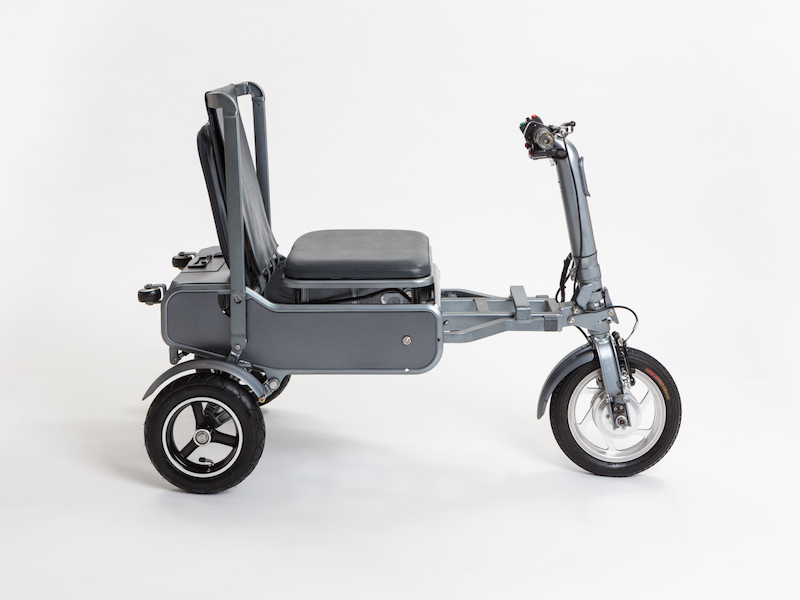 Technically the lightweight eFOLDi scooter is equipped with a state of the art brushless motor, AutoForged 6061 aluminium components and an advanced FarReach 24v 24AH Lithium-Ion battery plus a FastC charger giving a 6 hour charging time. (3 hours charging with optional SuperQ charger) This battery will propel the scooter up to 8mph with a range of around 14 miles. The scooter also comes equipped with a USB phone charging port, a horn, turning indicators, reversing beeps and a full lighting system. 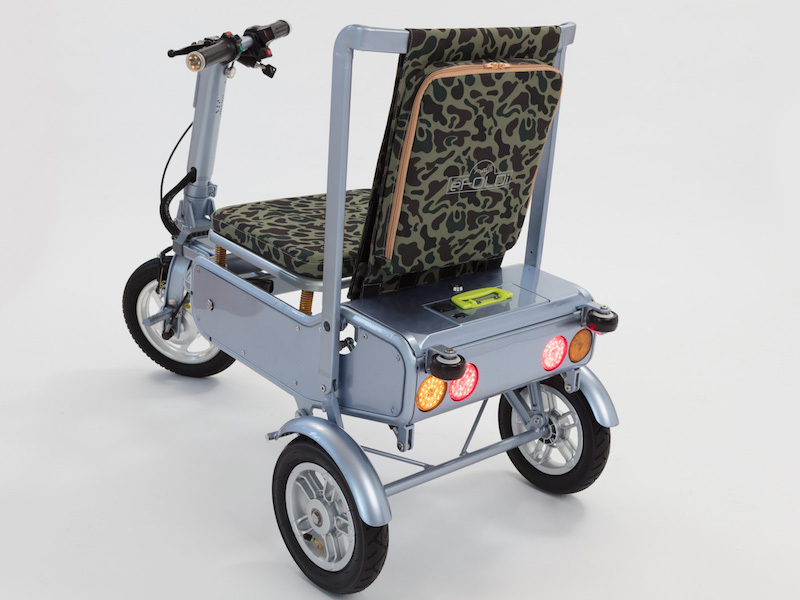 Safety wise, eFOLDi was designed with a 4-point balancing system for added stability and a key-switch is supplied for both scooter operation and battery security. “eFOLDi is a folding magic, fantastic invention! Simply brilliant!” say’s Sir Richard Branson. Imagine the personal freedom and independence this lightweight scooter could bring you. Traveling to the local shops, the park or beach with family and friends or just walking the dog on the local common; even coming with you to another part the world!! All without any physical assistance or hardship normally associated with a typical, heavy and unwieldy multi-part bog-standard mobility scooter. This is especially beneficial should you be traveling alone as the extremely lightweight eFOLDi fits conveniently into many forms of transport as just one single and easy to manage unit that weighs less than a fully packed holiday suitcase. Air travel is a breeze. If you have a disability, airlines will allow the FarReach 24AH 14 mile battery pack onboard, Able-bodied riders can still take eFOLDi onto an aircraft but will be restricted to the optional AirSafe 4AH Lithium-Ion 4 mile battery pack. (Always check with your airline before traveling). Air travel aside, eFOLDi with its super lightweight design and small footprint is easily lifted and fits comfortably into a car boot, most motorhome or caravan storage compartments, into a cruise ship cabin, coach, train or bus, and also into a home or hotel room cupboard for discreet storage. eFOLDi allows travel in total autonomy whether traveling alone or with others. And whats more, with eFOLDi, you travel in modern and fashionable style without the stigma normally associated with stereotypical and boring mobility scooters seen so often today. But not only that, eFOLDi is designed for absolutely anyone to use, you certainly don’t need to have a health condition or disability to ride eFOLDi. As a PEV (Personal Electric Vehicle) it can be used to ease the daily commute or simply for getting from A to B quickly, stylishly and comfortably. 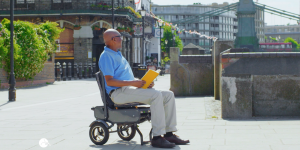 The eFOLDi is a scooter rather than a wheelchair and is supplied fully compliant with UK Invalid Carriage Class 3 regulations meaning it can be legally used on the road and pathways. Class 3 riders will need to register the scooter (At no cost) with the DVLA and it is advisable to obtain third party insurance regardless of where eFOLDi is used. Please make sure your speakers are turned on. This promotional video presented by Sumi Wang will take you on a journey using eFOLDi. Younger or older people are buying eFOLDi because it is so versatile. What are the dimensions? LxWxH Scooter: 121 x 56 x 83 cm / 48 x 22 x 33 in. | Chair: 66 x 56 x 83 cm / 26 x 22 x 33 in. | Suitcase: 85 x 56 x 37 cm / 34 x 22 x 15 in. What is the eFOLDI warranty? A full 12-month no-quibble warranty is provided for any design and manufacture defects except for consumable items such as tyres and LED bulbs. What happens if I have a problem with my eFOLDi? In the very unlikely event your scooter develops a fault, there are two dedicated service centres ready to assist. Your scooter will be collected by courier, repaired quickly and returned to you. If someone is demoing near you, the fault could be fixed same day. Can I use eFOLDi in the rain? Yes. eFOLDi is equipped with mud guards and is designed to be water-resistant. The battery box is sealed water-tight so it is safe to use in the rain. To operate the eFOLDi you will need use of both hands to fold and unfold the scooter. You should be able to place yourself onto the seat and remain in a seated upright position at all times without assistance when the vehicle is in motion whilst operating the controls fully and as intended. Steer competently and appropriately in all conditions. Maintain appropriate awareness of all relevant circumstances for each journey and take appropriate action as may be required to avoid mishap. FREE DELIVERY & 3 MONTHS FREE INSURANCE! eFOLDi was the brainchild of Jianmin Wang. He is an eccentric man and a genius. In 2012, he broke his leg and instead of complaining to anyone about the lack of suitable personal transport, he sketched up his own design which gave him freedom, pride and most importantly, fun! Like all the best ideas, it wasn’t intended to change the world, instead it was supposed to solve a problem and it did. 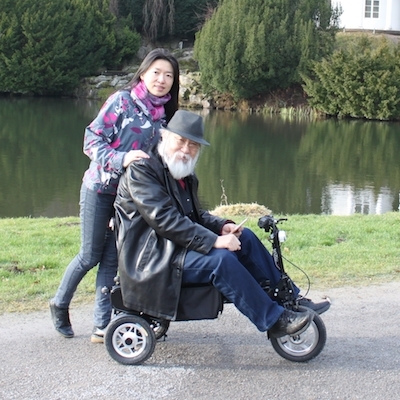 Simply by designing a practical and lightweight device capable of helping him get around, Jianmin had created one of the greatest breakthroughs in personal travel since the dawn of e-transport – The eFOLDi was born!. Don’t just assume eFOLDi was drawn up and designed by someone without any conceptual skill or engineering acumen.. Jianmin served 49 years as the Technical Director of the Chinese Acrobatic Circus and was responsible for some of the most astonishing circus equipment and props ever seen. Jianmin Wang’s mind is creative and unique, as is the strong and safe eFoldi! Joined now by his co-inventor daughter Sumi Wang, the eFOLDi is on course to be a life changer for many people. Contact us now to arrange a free no obligation mainland UK demo. If you are looking for something a little larger but still lightweight you might want to consider the eFOLDi auto folding power chair. Note: Easy to make mis-spellings of the eFOLDi scooter are e-foldi e foldy efoldy eefoldy efolde or efoldee. As with any mobility device we always recommend taking out specialist wheelchair insurance. This will protect you in the event of an accident involving other people or their property. Magic Mobility Ltd who are covered by the FCA, have teamed up with a leading supplier who’s policies are underwritten by SAGIC, the Salvation Army General Insurance Corporation. SAGIC is the only underwriter to give back all its profits to help those in need. We can provide the best level of cover stating at just £4.40 per month. Get a quote now..
Look out for the eFOLDi folding scooter TV advert. The TV commercial might be in your area soon. 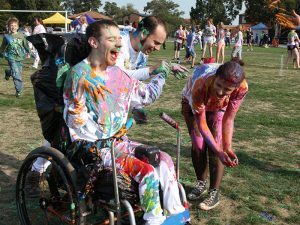 Magic Mobility Ltd are a forward thinking company dedicated to making life easier and more pleasurable for people with disabilities. We pride ourselves in keeping abreast of the latest in mobility technology whilst still offering day to day necessities at competitive prices. Please call us on 0117 915 6186 or for direct engineer contact 07733 438555. 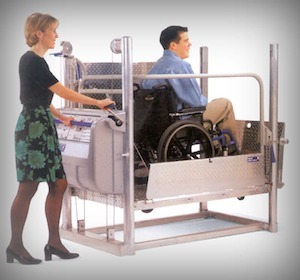 The portable wheelchair lift saved our day when we realised we had wheelchair users coming to our presentation event. Phil and his partner organised a lift for us at very short notice. Great service!! We use SSL or Secure Sockets Layer is technology to encrypted any information you exchange with us. This ensures your information is kept safe from prying eyes. Hover over or click on the security seal to see our security certificate validity. Founded in 2008 by sales engineer Phil Francis, Magic Mobility Ltd continues to grow and is proud to offer revolutionary mobility solutions not often seen elsewhere. Why not contact us now to see how we can help you.